Bolsas y Mercados Españoles (BME) is the operator of all Stock Markets and financial systems in Spain. BME Group was formed in 2002 as the result of the integration of different financial markets and individual market infrastructures: Bolsa de Madrid, Bolsa de Barcelona, Bolsa de Bilbao, Bolsa de Valencia, Iberclear, AIAF, MEFF and SENAF. BME has been a listed company since 14th July 2006. Its shares are traded in the Spanish continuous market. BME’s activity is very diversified and is organized into seven business units: Listing, Equities, Fixed Income, Derivatives, Clearing, Settlement, Market Data, Consulting and IT. Currently, BME Group has more than 20 subsidiaries, such as Bolsa de Barcelona, Bolsa de Bilbao, Bolsa de Madrid, Bolsa de Valencia, MAB, AIAF, MEFF, BME Clearing, Iberclear, BME Market Data, Infobolsa, Visual Trader or BME Innova. In the legal field, after the entry into force in 1988 of the Ley del Mercado de Valores – Securities Market Law (Law 24/1988 of July 28), foundations were laid for the modernization of the Spanish Securities Market. 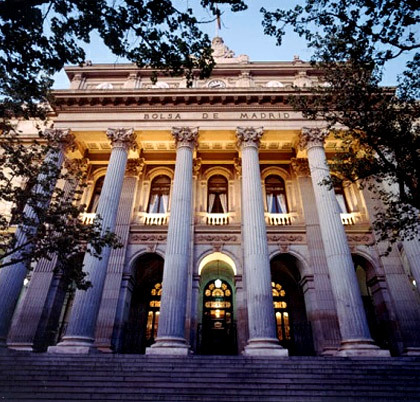 Some of the relevant changes include the demutualisation of stock exchanges, the merging of Spanish stock exchanges in one single electronic order book through SIBE Trading Platform, as well as the constitution of a Clearing and Settlement Service (SCLV), the development of a market and central clearing house for derivatives, and the establishment of a supervisory body (Comisión Nacional del Mercado de Valores, CNMV). Since the enforcement of the Ley del Mercado de Valores (LMV), the Spanish Market has continuously evolved in order to adapt to an increasingly complex technological environment and regulatory framework. The entry into force in 1996 of the European Investment Services Directive introduced, among others, the “European Passport” for investment firms, whose main effect was the opening of borders within the EU for the provision of investment services. In 2007, the entry into force of the Markets in Financial Instruments Directive (MiFID) implied the introduction of a wave of deep changes in the arrangement of the securities industry in Europe. Some of its main developments include the creation of alternative trading centres, the ensuing European market fragmentation, and the establishment of common rules of conduct and organization for investment firms. At present, the MiFID and other relevant pieces of legislation for the European securities market are under review. In 2011, Law 32/2011 was enacted amending the Spanish Securities Market Law, and introduced measures to reform the Spanish securities clearing, settlement and registry system; and Iberclear Regulation, as amended, was formally approved. Both initiatives have been designed to harmonize the regulatory regime for the Spanish post-trade processing system within the European framework. Migration to a registry system based on balances. Integration of the current CADE & SCLV into a unique platform. First phase: CCP implementation and migration of SCLV to the new platform. Second phase: migration of CADE to the new platform and connection to T2S. Iberclear is the Spanish Central Securities Depository (CSD). It was established in 2003, as a result of the merger between SCLV (Securities Clearing and Settlement Service, for equities and fixed-income instruments) and CADE (Spanish Public Debt Book-Entry System, responsible for the registering, clearing and settlement of government debt, managed by the Banco de España). To provide technical and operational services directly related to securities registration, clearing and settlement services. In this regard, among such services, Iberclear provides securities delivery assurance in case of default incurred by selling brokers. For such purposes, Iberclear has implemented securities lending/borrowing and repurchase mechanisms. At present, the Spanish system of securities registration, clearing and settlement is undergoing a process of reform, whose main pillars are the elimination of the principle of assured delivery, this being replaced by the introduction of central counterparties (CCPs), and the implementation of a net settlement model. BME Clearing is the Central Counterparty Company (ECC, for its name in Spanish) of the BME Group. Until September, 2013, MEFF has been the one who had the conditions of official market and CCP. The European regulation, through the EMIR normative, has obliged to divide the ordering activities in the markets from the clearing ones. As a consequence, MEFF has taken the market activity and BME Clearing manages the CCP activity. BME Clearing performs the clearing operations of the three activity segments in derivatives that BME has at present: financial derivatives, repos on public debt and derivatives on energy traded in MEFF Exchange. In the future, segment of Shares and Fixed Income will be included as well. To determine the contracts in which BME Clearing will act as CCP and to approve General Conditions applicable to BME Clearing on its services of registration, CCP, clearing and settlement. To organize, manage, order and supervise contract clearing and settlement. To organize, manage, order and supervise the General Registry. To order and supervise the detailed registration performed by Registry Members. To act as CCP in the corresponding contracts. To calculate, demand and control the amount of guaranties needed to cover the risk related to open positions. To report to a trading Registry or to the Autoridad Europea de Valores y Mercados (AEVM), -according to applicable regulations-, the details of contracts where BME Clearing act as CCP and transactions related to them. According to the instructions established, in each case, by AEVM, BME Clearing will be able to set criteria and reporting formats of the notifications that members and clients might do to a trading Registry, or to the AEVM, related to the information of the contracts in which BME Clearing is CCP or the operations performed in relation with them. Ibero-American Federation of Stock Exchanges (FIAB) – Founding Member, 1973. World Federation of Exchanges Ltd (WFE Ltd) – Founding Member, 1961. Federation of European Securities Exchanges (FESE) –Member, 1986 (Participant since 1974). International Organization of Securities Commissions (IOSCO) – SROCC Member, 1996. European Association of CCP Clearing Houses (EACH) – Iberclear and BME Clearing, 1992. European Association of Central Securities Depositories (ECSDA) – Iberclear Founding Member, 1997. European Capital Markets Institute (ECMI) – 1993. Centre for European Policy Studies (CEPS) – Corporate Member. Spanish SWIFT User Group (SWIFT GNUSE) – BME Clearing, 1992.
International Securities Services Association (ISSA) – Iberclear, 1988. European Covered Bonds Council (ECBC) – AIAF. Asociación Madrid Centro Financiero Internacional – Madrid Stock Exchange, Founding Member, 2008.
International Swaps and Derivatives Association (ISDA) – BME Clearing, associate member, 2010. 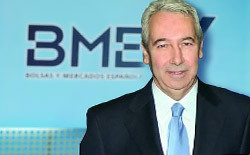 Fundación Estudios Financieros (FEF) – BME, Board of Trustees Member. Information Sharing Agreement. Bolsa de Madrid – Bolsa de Comercio de Buenos Aires, 1991. Information Sharing and Technical Assistance Agreement. Bolsa de Madrid – Bolsa Mexicana de Valores, 1992. Information Sharing Agreement. Bolsa de Madrid – Chicago Board Options Exchange, 1992. Information Sharing and Mutual Advisory Agreement. Bolsa de Madrid – Bolsa de Comercio de Santiago, 1992. Market Supervision Agreement. Bolsa de Madrid – American Stock Exchange, 1992. Cooperation Agreement. Bolsa de Madrid – CEDBORSA, 1992. Information Sharing Agreement. Bolsa de Madrid –New York Stock Exchange, 1993. Information Sharing Agreement. Bolsa de Madrid – Philadelphia Stock Exchange, 1993. Information Sharing and Mutual Advisory Agreement. Bolsa de Madrid – Bolsa de Valores de Lima, 1993. Information Sharing and Mutual Advisory Agreement. Bolsa de Madrid – Lisbon Stock Exchange, 1993. Information Sharing, Technical Assistance, Staff Training, Trade Cooperation and Market Promotion Agreement. Bolsa de Madrid – Mercado de Valores de El Salvador, 1995. Technical Assistance Agreement. Bolsa de Madrid – Athens Stock Exchange, 1995. Information Sharing Agreement. Bolsa de Madrid – Taiwan Stock Exchange, 1998. Information Sharing and Mutual Advisory Agreement. Bolsa de Madrid –Sao Paulo Stock Exchange, 1998. Information Sharing and Mutual Advisory Agreement. Bolsa de Madrid – Bolsa de Valores de Caracas, 1998. Information Sharing Agreement. Bolsa de Madrid –Cairo and Alexandria Stock Exchange, 1998. Coordination Agreement. Bolsa de Madrid –Rio de Janeiro Stock Exchange, 1999. Collaboration Agreement. Bolsa de Madrid – Inter-American Development Bank (IDB), 2002. Information Sharing and Technical Assistance Agreement. Bolsa de Madrid – Bolsa de Valores de la República Dominicana, 2002. Collaboration Agreement. Bolsas y Mercados Españoles – Bolsa de Comercio de Santiago, 2009. MOU. Bolsas y Mercados Españoles – Shenzhen Stock Exchange, 2010. MOU. Bolsas y Mercados Españoles – Korea Exchange, 2011.